The new Rigel Medical 288 field service kit has been specified for the electrical safety testing of devices used at dozens of Ministry of Defence medical, veterinary and dental servicing centres around the world. Fifty units are being supplied as part of a deal which will see Rigel providing training and support to MOD trainers who will be instructing army, navy and airforce technicians on how to use the testers properly in military theatres of operation, including Afghanistan. The new 288 hand held devices will be used in conjunction with existing testers but meets the much needed requirement for a mobile option. Using the new testers, technicians will be able to significantly reduce the time involved in undertaking electrical safety checks on devices and equipment used at the military healthcare facilities, using the barcode facility that is available with the tester. Also, the 288´s ability to barcode and recall the test history of a device will be invaluable. The Medical and General Supplies Team (M&GS) specified the 288 kit after it was assessed by technicians at RAF Henlow in Bedfordshire. The M&GS Team is responsible for the provision and support of general, medical, dental and veterinary material and equipment for Britain´s armed forces, ensuring best value to the customer and the MOD as a whole. 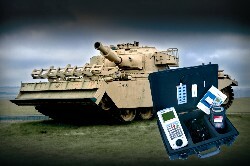 One of the key advantages is that the 288 is light, portable and the integrated barcode reader and printer means equipment can be identified and records recalled quickly, meeting the needs of technicians operating across the MOD in a more demanding mobile environment. The Rigel field service kit will reduce the time taken to test the electrical safety and operation of a wide range of medical devices and equipment used in hospitals, operating theatres and other facilities. It offers a flexible, easy-to-use and accurate solution for testing devices for electrical safety to appropriate standards and guidelines including IEC 62353 IEC/EN60601-1, VDE 0751-1, AS/NZS 3551, AAMI, NFPA-99, MDA DB 9801-2006. A state-of-the-art Bluetooth barcode scanner enables devices and equipment to be quickly and easily identified, while test results can be stored within the Rigel 288 safety analyser and printed wirelessly to the rugged battery operated Elite Test n Tag printer.